In the face of the contemporary so-called “European refugee crisis,”' the dichotomies of bodies that are naturalized into technology usage and the bodies that remain alienated from it betray the geographic, racial, and gendered discriminations that digital technologies, despite their claims at neutrality and flatness, continue to espouse. This article argues that “young electronic diasporas” (ye-diasporas) (Donà, 2014) present us with an unique view on how Europe is reimagined from below, as people stake out a living across geographies. 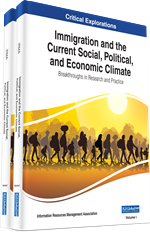 The main premise is that young connected migrants' cross-border practices shows they ‘do family' in a way that does not align with the universal European, normative expectations of European family life. The author draws on three symptomatic accounts of young connected migrants that are variably situated geo-politically: 1) Moroccan-Dutch youth in the Netherlands; 2) stranded Somalis awaiting family reunification in Addis Ababa, Ethiopia; and, 3) working, middle, and upper-class young people of various ethnic and class backgrounds living in London. Narratives shared by members of all three groups indicate meta-categories of the ‘migrant,' ‘user,' and ‘e-diaspora' urgently need to be de-flattened. To do this de-flattening work, new links between migrant studies, feminist and postcolonial theory and digital cultures are forged. In an era of increasing digital connectivity and mobility, transnational families are far from deterritorialized – boundaries and insurmountable distances are often forcibly and painfully felt. In the face of the contemporary so-called “European refugee crisis,’ the dichotomies of bodies that are naturalized into technology usage and the bodies that remain alienated from it betray the geographic, racial, and gendered discriminations that digital technologies, despite their claims at neutrality and flatness, continue to espouse. In this moment of crisis, the digitally connected migrant is currently getting a lot of flak, which is exemplary of “high-tech Orientalism” (Chun, 2008, p. 73). News headlines and social media tropes commonly question Syrian refugees who arrive in Europe carrying smart phones. For example, a front-page headline on the Dutch daily Algemeen Dagblad questioned, “Why do those refugees take selfies all the time?” (Rosman & van Mersbergen, 2016) while Twitter users like @DefendWallSt (See Figure 1) more explicitly consider refugees with smart phones as bogus asylum seekers. Included in this 5 September 2015 tweet is a broadly circulating photograph showing a veiled lady wearing a bright orange life-vest accompanied by a young boy wearing a yellow life vest. In the background, we see the contours of what might be the mainland of Turkey, a calm sea and a beached black inflatable rubber boat. Carrying luggage in one hand, she holds her camera-phone and takes a selfie with her other hand. Her expression is ambivalent, she simultaneously grimaces and smiles into the camera. From her face we can tell she is relieved to have arrived on European soil. For other Twitter users such as @allseeingeyes10, this evidences people like the lady in the photo have access to luxury goods, “They are all economic migrants,” adding “People are calling them refugees when clearly they are not” (05/09/2015). Apparently, people who own a mobile phone are not eligible for help in their attempt at fleeing from miserable war-zones like Syria. Through this discursive othering, refugees are de-humanized. Instead of triggering solidarity, European audience members avoid being affected by what they read and see on the screens of their smart phones. This is worrisome as Europe has become the deadliest migration destiny in the world (Wolff, 2015) and growing numbers of people still risk their lives in their desperate attempts to reach the continent. An estimated 950,469 people arrived by sea in 2015, and 3,605 people have died or are missing (UNHCR, 2015). So far in 2016, estimated fatalities stand at 2,861 one week before the mid-year point (IOM, 2016). This also raises doubts about the European Union’s commitment to open borders and human rights. Of course, although predicated on the idea “Unity in Diversity” (Ponzanesi & Colpani, 2016, p. 7), Europe’s sense of diversity and relationship with migration has always been strongly politicized and policed. While highly educated (white) expats – especially those from the ‘Global North’ are welcomed under “Europe’s Highly Skilled Migrant Scheme,” (black) asylum seekers are commonly ‘othered.’ Right-wing social media circuits frame male Syrian refugees not only as barbaric, backward, and posing a threat for European girls, but also as “terrorists” or “cowards” (Walker Retberg & Gajjala, 2015). These frames were also further mainstreamed in the right-wing anti-immigration Brexit campaign prior to the June 23 UK referendum on whether the UK should leave or remain in the European Union.